MYTH: Eating foods without fat is healthy because humans do not need fat. A “Zero Fat Diet” is what we should strive for. FACT: People require Essential Fatty Acids (EFAs). They are a critical component of good nutrition because our bodies cannot produce them naturally. MYTH: There is no kind of fat which is good for you. FACT: EFAs are good for you. They help to prevent and treat high cholesterol, high blood pressure, cardiovascular disease and diabetes. Emu oil gel caps are considered to be the best and cleanest source available for the Omega 3, 6 & 9 essential fatty acids. Common uses include high cholesterol, high blood pressure, high triglycerides, and are very effective for chronic pain and conditions. 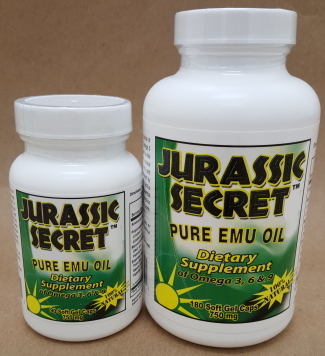 Emu oil supplements are also quite effective to aid and control the symptoms of diabetes and can also be an effective aid to weight loss. Essential fatty acids have been proven to stimulate the body's metabolism and increase the body's ability to burn stored saturated fats. The Omega 9 essential fatty acid is high in anti-inflammatory properties and produces a satiate response that helps give you the feeling of fullness. 750 mg per gel cap.